Updated 5/9/2015 to include Autodesk Shared Reference Point 2015. 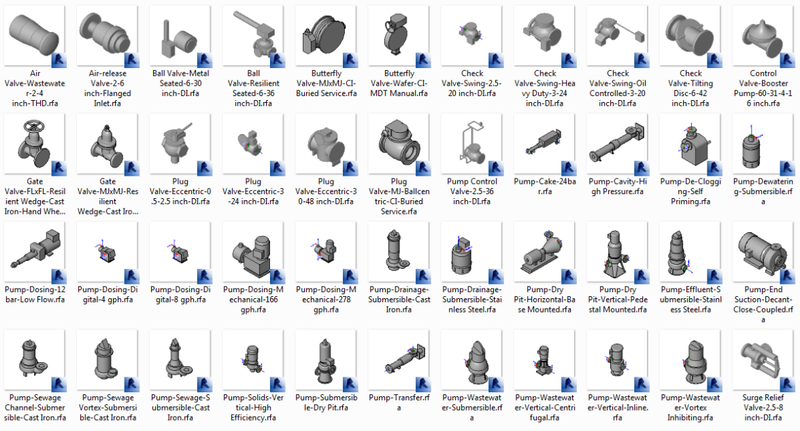 Updated 3/13/2015 to include AWWA Pump and Valve Content for Autodesk Revit 2015 and Autodesk Revit MEP 2015. Updated 1/31/2015 to include US Structural Content Extension for Autodesk Revit 2015, Autodesk Revit Architecture 2015, and Autodesk Revit Structure 2015. Updated 9/28/2014 to include Autodesk Revit 2015 R2 and Autodesk Site Designer Extension for Revit 2015. Until now, I've been remiss by not posting about the Revit 2015 product enhancements available via the Autodesk Subscription Center. Here's a roundup, with text from each enhancement's page. Autodesk® Shared Reference Point 2015 provides functionality to export known points and elevation from AutoCAD® Civil 3D software to an external file, in which Autodesk® Revit® software can import and setup a "Shared Coordinate System." This enables the collaboration of exported RVT, DWG and NWC files back to AutoCAD Civil 3D and to coordinate models in Autodesk® Navisworks® software. Content is available in English only. To access this subscription entitlement, log into Autodesk Account. The US Structural Content Extension for Autodesk® Revit® 2015*, Autodesk® Revit® Architecture 2015, and Autodesk® Revit® Structure 2015 provides the latest AISC standard 14.1 hot rolled structural steel shapes. The Autodesk® Site Designer Extension for Revit® 2015 software helps architects, designers, and planners convey building site planning concepts to engineers. Site Designer runs inside Revit software and uses native families, components, and toposurfaces, so site designs become part of the overall model. You can model alternatives for mass grading, building pads, streets, sidewalks, parking lots, and retaining walls all within the Revit environment. More easily convert a sketched line into a street, sidewalk, curb and gutter, retaining wall or parking lot in the model. You can manipulate Site Designer components using editing tools to change their location, elevation, grade or geometry, and Site Designer automatically updates and maintains the underlying toposurface. The Central European Content Extension for Autodesk® Revit® MEP 2015 software provides an English language version of the German content pack, helping to reduce the need for users to seek alternative sources of content where country-specific packs aren't available. Revit Server is part of the installations of Autodesk® Revit® 2015*, Autodesk® Revit® Architecture 2015, Autodesk® Revit® MEP 2015, and Autodesk® Revit® Structure 2015 software. It is provided here as a stand-alone application for your convenience. Content is currently available in English only. After preparing the default printer and the Revit software project, use Batch Print to send any number of drawings to the printer and to control the order in which they print. When you start the print job, Batch Print manages the printing of the drawings, requiring no further interaction from you. If desired, you can monitor the progress of the print job using a status dialog. To access these subscription entitlements, log into Autodesk Account.